Are you looking for a new way to effectively market your business and leave an impression on potential customers and companies in Pittsburgh and the surrounding local markets? Then consider becoming a sponsor of the Pittsburgh Business Show today! 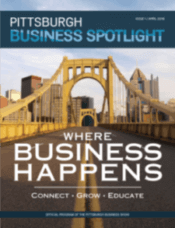 The Pittsburgh Business Show is a women-owned and operated Pittsburgh business supporting Pittsburgh businesses. When you become a sponsor of the Pittsburgh Business Show, you will have the opportunity to reach thousands of business owners, professionals, and businesses through the show, our social media, as well as our website and other online opportunities. Our sponsorship opportunities can help you build your brand and reputation, reach millions through marketing and media partnerships and will provide you with the chance to promote your business at one of the largest business-for-business trade show, conference and networking events, in the Northeastern United States. With these media opportunities, you can not only gain brand visibility, but you can also build partnerships with other local business, increase your online credibility, build your reputation, and effectively target your clientele. As an active sponsor of the show for this year and in the future, you can build on your company’s name recognition and gain an efficient source for generating leads every year that can help bring your businesses new opportunities. Our sponsors are encouraged to speak at the show or present a workshop to help you showcase your products and services, attract visitors to your exhibitor booth, connect with business owners and promote community involvement with your company. By speaking at the show, you can help to increase your company’s visibility at the show, increase sales, and build on the brand name recognition that our sponsorship opportunities provide. Become a Sponsor for the 2019 Show! This one-of-a-kind Business Show has more than one hundred thousand square feet of exhibitor space, and thousands of business owners, executives, and professionals will be attending. You’ll connect with Pittsburgh business owners who want to buy your products and use your services. This is your chance to meet Pittsburgh companies who are looking for the solutions that your business provides. You can expand your leads and client base while helping companies in our region grow and succeed. And, don’t forget that this Show is the city’s largest “business for business” networking event, so you don’t want to miss it. Industry limits for Sponsors are in effect, so be sure to contact us today!